Got the flat tire fixed in a jiffy by the vulcaniziador, and after all of our futzing around, and it took us a while to re-pack the bikes and get on the road. All told, it was around 10am when we finally left. We ran to the Oxxo convenience store next door to grab some breakfast – I got a pre-made sandwich with some kind of spicy shredded meat (we’re still not sure what kind), and some pink-fruit-filled buns, and Kay got some biscuits that were tasty but surprisingly dry. We also grabbed some cookies that had a picture of the Quaker Oats guy on the front, which it turns out was surprisingly tasty, but didn’t seem to involve oatmeal or granola. This cost us around $5. Kay went in to get up to ride the tire off, and I stayed with the bike, picking up our tools. The guy was standing there watching, and said a word which I sadly cannot remember. I explained that I didn’t understand (“no entiendo”) and he nodded, then said the word again and made an angry face, balling his hands up into fists and growling. I suddenly understood that he was trying to convey that it must be frustrating, and I responded with “Si! Si! Yes, very frustrating.” We both smiled because we’d communicated, even though we didn’t have a shared language. I was surprised and happy that he empathized, and he and the other guy who were working on the property cheered for us when we got the tire mounted again. It was really great. I didn’t mind, so much, not being able to speak Spanish at that point. We’d still managed to communicate and still shared a little victory together. So the morning’s riding was uneventful – I was just relieved to have Nargo back in one piece. Even though the flat was frustrating, it was really a relief to realize that it was something as simple as a flat tire that we could easily fix. I love my bike, and I know it’s bound to break down sooner or later, but it hasn’t let me down so far and I was relieved that the problem was so easy to deal with. The riding between Ciudad Mante and Ciudad Valles was less enjoyable. We were almost constantly in a 60km per hour speed limit (not quite 40MPH) and the roads did not appear to warrant that – they were mostly flat and straight and could easily have been taken at a faster pace. When we did get up to 80, we’d celebrate, but were almost immediately back down to 60KPH. The road also stopped being interesting – the hills were behind us and the lush vegetation had thinned out. All of the slowness on a road that didn’t warrant slowness and wasn’t particularly interesting was beginning to get frustrating by the end of the day. We didn’t really have a plan for the night, although I think Kay and I were both expecting that we’d try to hidey-camp. We’re far enough from the border now that neither of us feels nervous about that, and we only passed one police checkpoint and one military checkpoint today (neither had us stop) so we weren’t feeling particularly threatened by authorities, either. But we did discover a problem – the road we were traveling was too major and too well traveled for me to feel comfortable pulling off onto a dirt track and trying to find a place to hidey-camp. There were cars more-or-less constantly, and I though it would look suspicious for two big, foreign, heavily-loaded bikes to be turning off onto a small track. It was also pretty populated – we encountered a few areas between little villages that were probably sparse enough to hidey camp, but the further we went, the more little villages we ran into. I didn’t feel comfortable trying to pull off on a track and have it go right into some village, or right up to someone’s house. It’s not that there was a dense population, it was that there was a frequent population. I was expecting us to be traveling on more isolated roads when we tried to hidey-camp, or to find intermediary dirt roads that would take us into more sparsely-populated areas and wouldn’t look so suspicious for two heavily-loaded BMWs to be turning onto. Kay says the types of roads we were on today are the types of roads we’ll be likely to be traveling for much of the trip, since we have so much ground to cover and a limited amount of time to do it. If this is the way it continues, I’m either going to have to change my criteria for hidey-camping, or we’re not going to get very far because we’ll spend all of our money on hotels. We did make one attempt at pulling off on a track – Kay spotted one that was very overgrown – basically two tire tracks and tall grass in between. It probably wasn’t driven very often, and looked like it hadn’t been driven in quite some time. There was donkey poop at the beginning of the track, and Kay rode on ahead and reported in the headsets that he was passing someone’s house. Upon later reflection Kay suspects it was probably an abandoned storage shack (circular, made of sticks, and about 15 feet tall with one door). In the meantime, I stood with my bike at the top of the track staring down at it in horror, and when I made a pass at it, I was screaming and cursing in my helmet almost the entire time. The track descended a short hill, and then ascended another, longer hill on the other side. The descent and the ascent were intimidating enough for me, with my very limited off-road experience, but the tire tracks were rutted and full of big rocks and stones. My bike kept hitting them and skipping off to one side or another. Sticks and twigs were bouncing off my helmet, and I kept running across the big grass berm in the middle of the track because the rocks were bouncing me around. 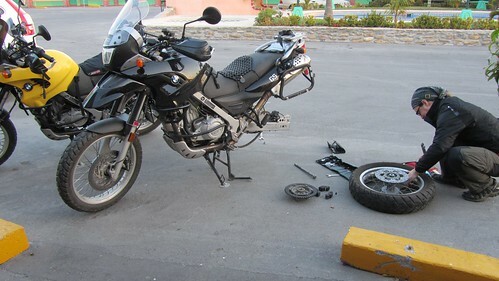 In all, I felt like I had zero control over the bike, and I panicked. I got halfway up the ascent on the other side, had a decent place to stop, so I did. I totally wussed out. I walked back to the road, and made Kay ride both of our bikes back down the hill and up again to get out of the track. It was a combination of negative factors that led me to completely overload. Had it been a track with two tire tracks and a lot of rocks on relatively flat ground, I would have made a go at it. Had it been a track with two tire tracks and no rocks with the ascent and descent that this path had, I would have tried to power through. But combine the ascent/descent and the rocks in the ruts and I in my off-road inexperience totally freaked out. At this point it was pretty much dusk and we had run out of options. It was either try to find an easier track and keep our fingers crossed that there would be a good “hidey-camp” spot, or ride into Ciudad Valles and find a hotel. We were only about 10 kilometers from the city at this point so hotel seemed like the best option. There were actually 2 quarter inch slashes and one 1/2 inch slash on the tube, plus a number of tiny cuts in the vicinity.